During the school year, TLC focuses on character education across all grade levels, with a goal of cultivating character through the promotion of basic moral, civic, and intellectual virtues. TLC Core Virtues represent common ground and do not include controversial social or political agendas. Coupled with the Core Knowledge Sequence, we are able to put something solid, sequenced, and specific in the hands of our teachers. Our Core Virtues include: Curiosity, Respect, Gratitude, Pride/Humility, Diligence/Perseverance, Courage/Fear, Joy/Sadness, Compassion, Generosity, and Faithfulness in the face of facts. 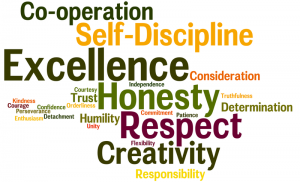 One value is assigned to each month of the school year as we help students to cultivate a vocabulary of virtue. Curiosity-How Do I Make Room for a new truth today? The more curious and creative you allow yourself to become, the more you gain perspective and wisdom, and you will in turn love what you are learning because you’re developing a virtue of wisdom and knowledge. Respect-What matters most? How do we measure and convey honor and esteem? Gratitude-How will I practice gratitude today, and with whom? Gratitude is thankfulness for the gift of life and gifts in life. Pride/Humility – Am I taking up too much space? Too little? Who else can I learn from? Diligence/Perseverance – If not now, when? If now, how, in order to sustain enthusiasm for the project? Perseverance is sticking to it – even when you’d rather give up. Courage/Fear – If courage and fear are dance partners, what does the routine look like in my life? Joy/Sadness-How can sadness, as well as joy, deepen human connection? Joy is the fullness of spirit that blooms from the loving heart. Compassion-Do I have limits or preconditions for compassion? What are they? Compassion is feeling what others are feeling and trying to help with their troubles. Generosity-In what ways do my greed and my “need” impact my efforts to be generous? Generosity is giving without thinking about getting. Faithfulness-What’s the next step in my efforts to be a faithful, trustworthy, and true friend? Faithfulness is standing by those we love, those we serve, and what we believe.